Messick Plumbing, Heating, and Air Conditioning has been serving Central NJ and Eastern PA Communities for over 30 years. Our knowledgeable professionals can diagnose any issues and determine the best solutions for your comfort needs. Our Heating and cooling offerings include warm air furnaces, baseboard heat, steam boilers, hot water boilers, hot water heaters, central AC units, home humidifiers, and oil to gas conversions. Our plumbing services include drain cleaning / unclogging, kitchen / bathroom fixtures, water treatment, well pumps, sewer ejector pumps, sump pumps, garbage disposals, remodeling, sewer cleaning, leaking pipes, appliance hookup, backflow prevention, and septic repair. In addition to new installations and repairs, we offer general maintenance to make sure your systems are operating efficiently. We provide same day service and 24/7 emergency assistance. Our friendly customer service will answer any questions you may have. Visit our site for a free quote! 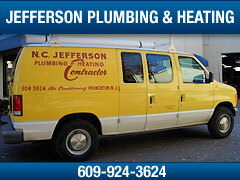 With 92 years in the plumbing, heating and cooling business, Redding’s has earned a reputation for providing quality products, installations and repair services to our customers in Mercer County and the Greater Princeton community. Our business is family owned and operated, so you can trust our first-class, professional NATE certified technicians and plumbers to keep your family comfortable through all seasons. We offer equipment maintenance plans to ensure maximum efficiency and lasting value from your heating and air conditioning equipment. Redding’s is a BPI Gold Star Accredited Contractor with in-house BPI Certified Home Energy Auditors, so our customers can benefit from NJ's Home Performance with Energy Star Program, as well as other State and Federal incentives. Whether you have a minor plumbing repair, suspect a leaking water service or need to replace your air conditioning system, you can count on Redding's to get the job done right- call us today!